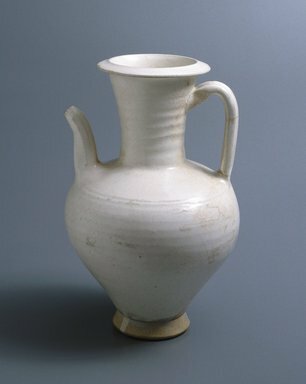 This exemplary Cizhou ewer, although unsigned, conforms to the Julu Xian type with ovoid horizontally ribbed body, high wide shoulder narrowing to small base; long slender ribbed neck with everted mouth; long slightly curved vertically ribbed spout on the shoulder; grooved strap handle attached to the shoulder and top of the neck opposite the spout; and a flaring foot. It is made of a coarse, pale, gray clay which is coated with white slip to enhance its appearance. A transparent glaze is then applied. The pale brown crackle, covering half of the interior of the neck and the entire exterior of vessel to the unglazed foot, is evidence of water damage from the time of the flood and as such these characteristics exemplify the Northern Song Cizhou white glaze method as seen in Juluxian wares. The present ewer can be traced to the Cizhou kiln of Hebei and dated ca. 1108 or earlier. Julu Xian, located in Hebei Province. In 1108 a flood buried the entire region which remained undiscovered until the 1930s.